Born on 15/12/1946 in Benifato, a small town in the Guadalest Valley, Ricardo Fracés grew up in front of a small smithy where he spent hours there as a child, watching the bicycles, motorcycles, radios, clocks, welding the broken pieces, repairing hunting rifles, … Here begins his love for the world of workshops and machines. 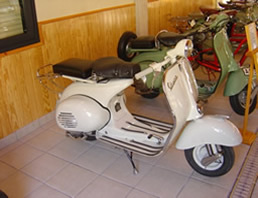 With the short age of 13 years and dared to drive a Vespa 125 2nd model, his father, this was in the 60s. At 18 years dreamed of a Derbi Gran Sport 74, but it was only a dream. At the age of 19 he tried to buy a sports motorcycle, the Ducati 125 Sport or the Ducati 200 Elite but for the precarious family economy he had to settle for a Ducati 175 TS, shared with his brother. A few years later, together with his wife and brother, he founded the Restaurant “El Riu”. 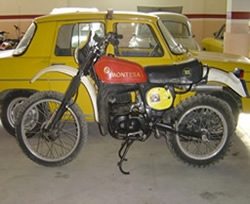 With the first profits of this business acquired a Montesa Enduro 360 H6 to be able to enjoy the numerous forest roads existing in this mountainous zone. Little by little he begins to take an interest in the world of classic motorcycles and buys a Guzzi 65 and intends to restore it. 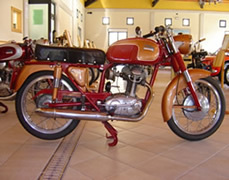 This bike was well known among Spanish fans and is usually one of the first to restore fans or collectors. For his fondness for the Ducati restores a Ducati 98 Sport. His hobby is increasing and begins to move and search for Spanish motorcycles in the area of Levante. I used to look for scraps and small workshops where motorcycles were forgotten in some corner. Thus began to be known and many people came to him to offer motorcycles that no longer used and were abandoned. Start traveling around Spain and attend specialized fairs in the world of motor. The first one he attended was in Sils (Girona) followed by Barcelona, Madrid, Valencia, Alcañiz, Murcia, etc. For his obligations in the family business he was forced to travel at night traveling many kilometers in a single day. And so, his collection was increasing. All this thanks to its effort and effort because if it is not for real hobby would not have been possible. When I bought a motorcycle, just to get home, the first thing I did was clean it with a brush and gasoline and see the pieces that were missing because it always tries to be totally original and so you can take to restore friends and retired mechanics who also shared their delusion. 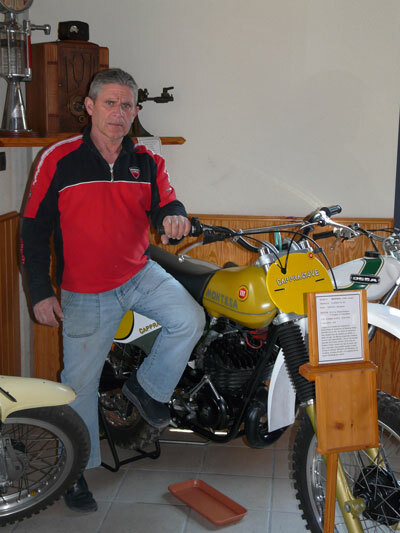 Currently Ricardo’s collection consists of about 140 motorcycles and several cars, a work that would not have been possible without the support of his wife, his 2 children and his brother and family.